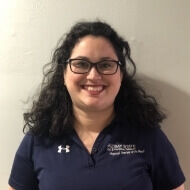 Sara is a graduate of Simmons College Doctor of Physical Therapy Program, earning her degree in August 2015. She earned her Bachelors in Kinesiology from the University of Massachusetts Amherst in 2011. Sara treats a variety of orthopedic conditions and has a passion for patients with neurological conditions. Her clinical affiliation experience included working with patients in geriatric population in a skilled nursing facility, acute care hospital experience, custom foot orthotic prescription and fitting, and working with multiple orthopedic conditions. Sara grew up in New York and moved to Massachusetts full time in 2012. In her free time she enjoys traveling, reading, trivia, going to the beach, and watching sports (especially hockey).